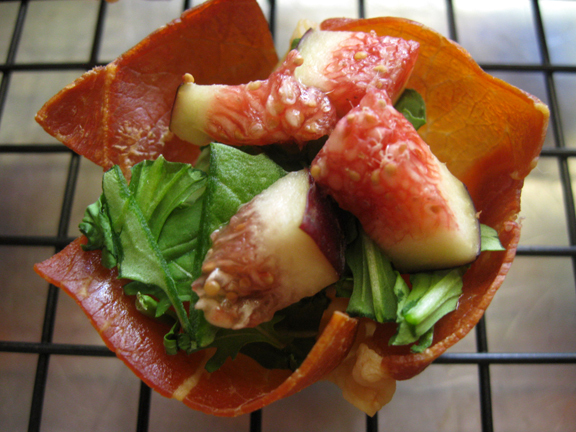 Sweet & savory prosciutto cups are a delicious gluten-free appetizer! They’re so beautiful they’re like edible art! How is it possible that Thanksgiving is less than two weeks away! I don’t know about you, but I’m so excited for Thanksgiving this year! It’s going to be a totally different kind of experience for my entire family. This year we are packing up, leaving suburbia and heading for the hills, literally, we will be enjoying Thanksgiving at our cabin in the country! I cannot wait! But that isn’t the only thing that will be different this year. This year we will be incorporating a gluten-free theme into our holiday feast, due to the fact that my sister was just recently diagnosed with celiac disease. Celiac disease is a digestive disease that damages the small intestine and interferes with absorption of nutrients from food. That means that my sister cannot tolerate gluten which is a protein in wheat. We’ve all been trying to wrap our arms around this new lifestyle and way of cooking and wouldn’t you know that in the serendipitous way that life is, many fabulous, wonderful, gluten-free people have come into my life through blogging! One of these people is Shauna of gluten-free girl. Thanks to Shauna, I am taking part in a “gluten-free Thanksgiving” extravaganza that includes 50 plus bloggers, (some gluten-free and some not), that have all taken the gluten-free challenge! I just love a good challenge! Especially when I can learn something. 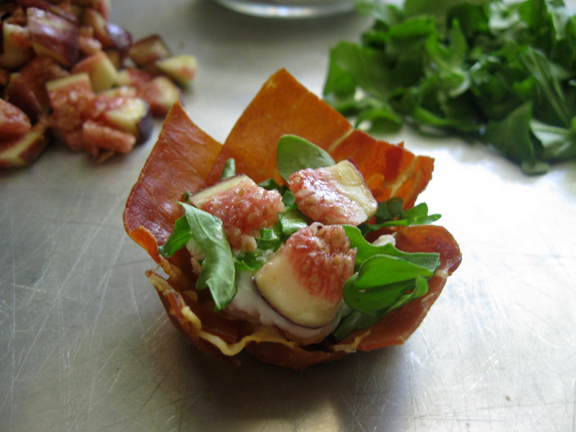 I’ve decided to make a naturally gluten-free recipe…I will be bringing prosciutto cups filled with goat cheese, arugula and fresh figs to the Thanksgiving table this year. They are incredible! Delicate, sweet & salty little bundles of deliciousness I tell you! It really couldn’t be any easier. Get your taste buds ready! I bought all of my ingredients from Trader Joe’s, they do a great job of letting you know what products are indeed gluten-free. As a matter of fact, this recipe was inspired by Scottie, one of my faves at TJ’s. And of course prosciutto. 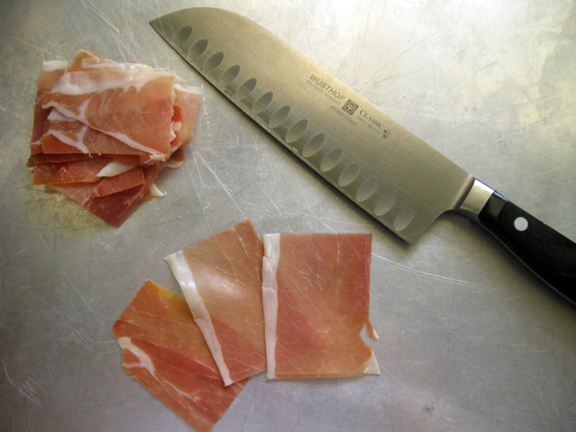 You’ll want to cut the prosciutto into small (approximately 2inch by 3 inch) rectangles. 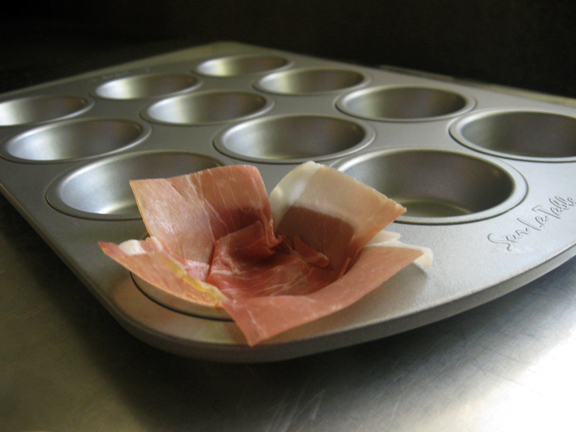 Next grab a mini muffin tin pan and gently press four pieces of prosciutto into each cup. 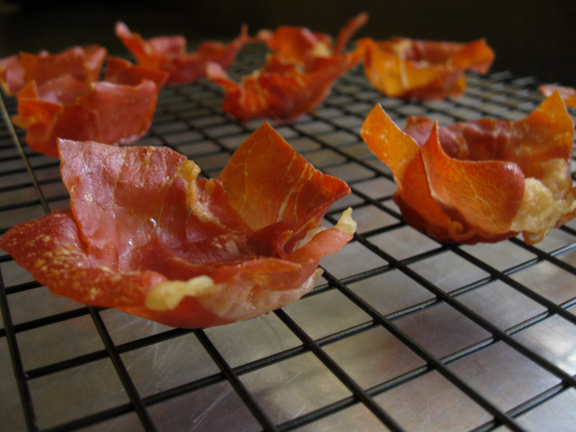 Bake the prosciutto cups at 375º for about 15 minutes until nice a crispy and they hold their sweet little cup-like shape. Once they are baked, immediately place them on a cooling rack. Edible art in my opinion. After the prosciutto cups are cool, it’s time to fill them. First a healthy dollop of creamy goat cheese. Then a sprinkling of chopped arugula. And finally a smattering of diced fresh figs to seal the deal. I’m telling you, it’s edible art! It really is! These gorgeous little bundles even enticed my two daughters! 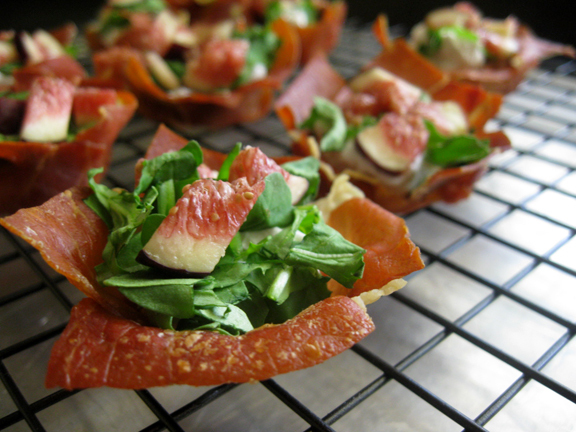 I am thankful that these marvelous little prosciutto cups will be adorning our holiday table this year! Not to mention that they have become an all time FAV! Participating in this gluten-free challenge was a joy! I learned that gluten-free cooking is fun and easy and totally satisfying, even when you don’t need to eat gluten-free! 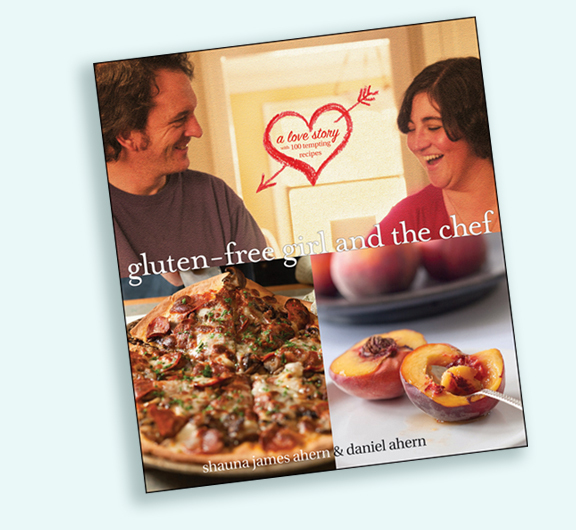 For more incredible recipes, check out gluten-free girl’s newest fantabulous cookbook. It would make a great holiday gift and you can find it on Amazon! For other delicious gluten-free recipes, check out these other fantastic folks who participated in this gluten-free Thanksgiving fun in the links below! Here are the links, check them out! Amber of Blue Bonnets & Brownies made apple and pear cobbler for lucas. Andrea Meyers of Andrea’s Recipes made gluten-free pumpkin scones. Ashley Rodriguez of Not Without Salt made gluten-free chocolate biscotti. Charissa Fleischer of Zest Bakery made warm pumpkin polenta with goat cheese. Deanna Schneider of The Mommy Bowl made gluten-free bread. Debra Smith of Smith Bites made gluten-free celery root soup with cashew cream. Gaby Dalkin of What’s Gaby Cooking made gluten-free molasses cookies. Stephanie Stiavetti of Wasabimon! madegluten-free butternut squash pie. Heather Flett of Rookie Moms made chocolate peanut butter brownies. Heena Punwani of Tiffin Tales made glorious gluten-free Thanksgiving torte. Heidi Kelly of Adventures of a Gluten-Free Mom made crescent rolls and cinnamon rolls, gluten-free, dairy-free, and egg free. Irvin Lin of Eat the Love made gluten free maple sweet potato cheesecake with gingerbread bottom and sour cream marshmallow topping. Jean Layton of Gluten-Free Doctor Recipes made gluten-free sourdough rosemary rolls and gluten-free mincemeat cookies. Kamran Siddiqi of Sophisticated Gourmet made cranberry-almond-coconut macaroons topped with chocolate. Karen Schuppert of Cook 4 Seasons made gluten-free pumpkin mousse. Kim Maes of Cook It Allergy Free made cornbread and (shauna’s) crusty bread stuffing with apples, sausage, pine nuts, and… a special ingredient. Maria Lichty of Two Peas and Their Pod made gluten-free apple cranberry crisp. Melissa McLean Jory of Gluten-Free for Good made gluten-free cherry cobbler. Molly Birnbaum of My Madeleine made butternut squash soup. Nancy Kohler of The Sensitive Pantry made gluten-free brown sugar hand pies. Nikki Gardner of Art and Lemons made gluten-free rustic squash tarts. Paula Jones of Bellalimento made gluten Free pumpkin roll with mascarpone and nutella filling. Shaina Olmanson of Food for My Family made a gluten-free apple pie cheesecake. Shirley Braden of Gluten-Free Easily made candy carrot coins. Silvana Nardone of Dish Towel Diaries made kale caesar slaw. Tara Barker of A Baking Life made gluten-free gingerbread cake with vanilla-bourbon Bavarian cream and cinnamon-brown sugar caramel. Tia Hain of Glugle Gluten-Free made gluten-free pumpkin muffins. Aran of Cannelle Et Vanille made sweet potato and crabapple clafoutis. Easy Appetizer | Cranberry and Goat Cheese Crackers Baked Goat Milk Brie Wrapped in Phyllo Dough Prosciutto-Wrapped Asparagus Simple & Sweet Farmer’s Market Treat! These are the cutest little cups! Fantastic post! Looks delicious, my friend. And you are so right….edible art! Very exciting sister!!! Thank you very much! I can’t wait to get into the kitchen and get cookn’! LOVE THESE! I am so glad you’ve provided an appetizer idea for next week—something new, fresh and creative. As Carrie says, they are edible art. Wow. Great idea for GR cups. I love it. You had me at prosciutto! Swoon! Gorgeous Wendy! How “mini” are the mini cups. My mini pan makes (literally) bite-sized muffins. Is that what you mean? Will you be serving these as an appetizer? I will admit to being math challenged, but I’m still trying to figure out how 28 pieces get divided into 9 cups @ 4 each. I will be using these as an appetizer and the muffin tin that I used makes the bite sized muffins. 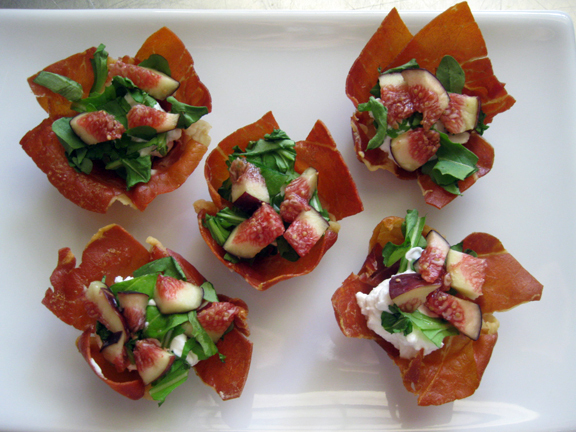 Thanks for stopping by and I hope that you enjoy the prosciutto cups! You certainly rose to the challenge, Wendy! Delicious! What a great way to use prosciutto! I’m sure your sister will appreciate this pretty appetizer. Have a wonderful time at your cabin. Wow, Wendy! You met that challenge and conquered it! Not only do these look absolutely delicious, you’re so right they are definitely edible art. Beautiful recipe! these look awesome, I am most definitely going to make them for an app this year for Thanksgiving! Thank you! Ok these might become a yearly tradition. And now the hunt for figs begins! Yum, yum, yum! These look marvelous! Wendy – perfect! Loving the flavor combination. Have a wonderful Thanksgiving with your family. Seriously the most beautiful thing I’ve seen in a long time. Great recipe and gorgeous pictures! This looks so good! This is BRILLIANT! 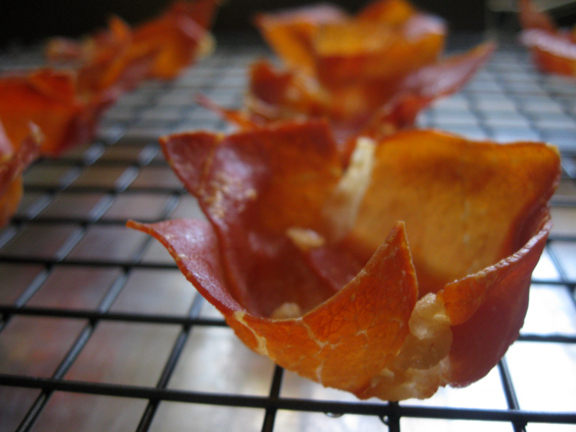 I never thought of making prosciutto cups, but they seem so crazy easy to make, and so very very cute! Talk about versatile! You can put so many things in them! But, of course, what you choose to put in them sounds fantastic. 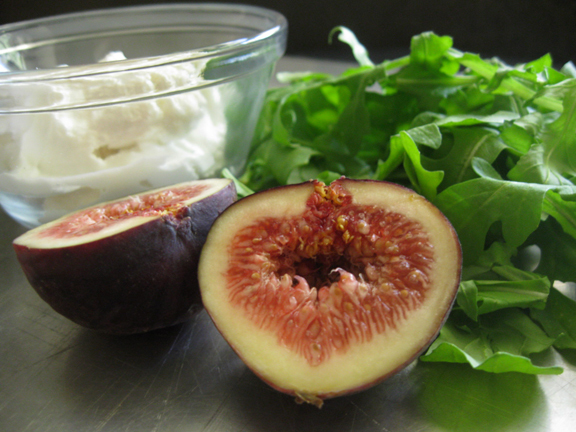 I’m slowly coming around the idea of sweet and savory together but fresh figs and goat cheese and the spicy arugula sounds like an amazing combination! Now I just have to throw a dinner party soon… oh wait, Thanksgiving is coming up! ha! These look absolutely gorgeous! And how perfect for Thanksgiving! These are wonderful Wendy; not just the mix of ingredients but the beautiful results; you are an artist in the kitchen! Hey kiddo! I’M SO GLAD THAT THESE WORKED FOR YOU! they look absolutely scrumptious! Time for me to try them your way;) BTW… You’re one of my favs too! Hey Wenderly this recipe looks great! I am not a huge fan of goat cheese. Any suggestions of cheeses you could substitute for this recipe?? Thanks so much for stopping by! Sure you could use a different cheese! I would recommend a soft creamy mild cheese such as a Boursin plain or even the cracked pepper or a cream cheese could do the trick too! It really depends on your own personal palette but I think that either of those would taste delish! Make sure to let the cheese warm up and mix it so that it is really soft before you put it in the prosciutto cups! Oh are adorable! And they look delish. I think I’m going to try these for New Years! Hello! This is my 1st comment here so I just wanted to give a quick shout out and tell you I really enjoy reading your posts. Can you suggest any other blogs/websites/forums that go over the same subjects? Thanks for your time! Trying to print this recipe, but cannot find a “print” icon! Help! Just updated the recipe to a recipe card! Should be easy to print now! My husband has a very big dislike of arugula….i mean super big. Is there something I could use that would still offer that nice contrast. Basil perhaps? Thank you so much Tracey!! 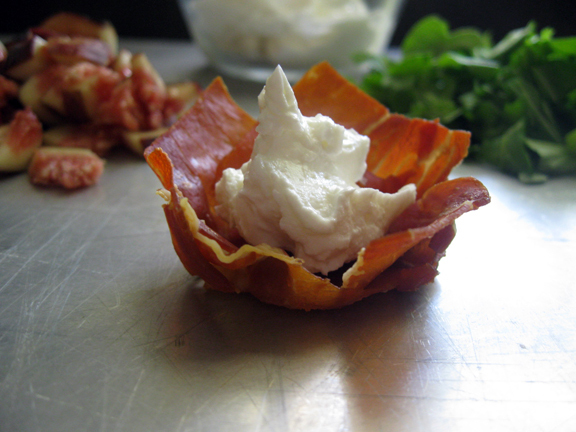 Legit speechless, these sweet savory prosciutto cups recipe looks unreal! I am obsessed with healthy desserts! I’m also gonna pin this post on my Pinterest board my followers will love it. Thanks for sharing, Wenderly! Why thank you so very much Jill! 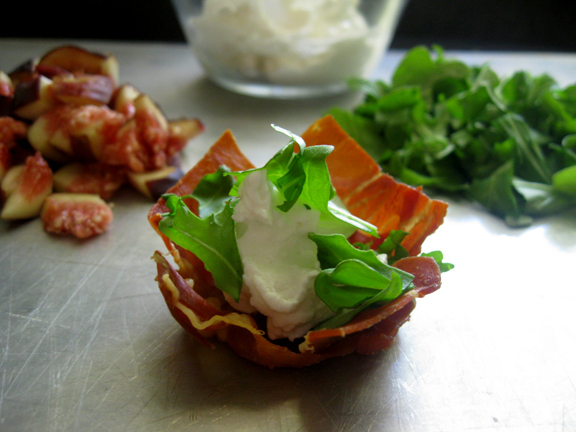 I had a similar sweet savory prosciutto cups at a restaurant recently and found myself craving it and wondering if I could recreate them today.